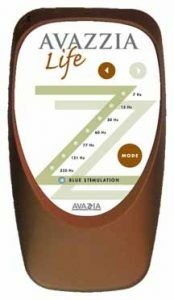 Distributors of Avazzia, Who Make Electrical Stimulation Devices for Pain Relief, Cosmetic Enhancements and Overall Well-being. 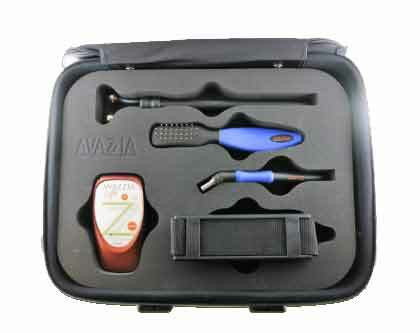 Pre- set to 8 programmes, Avazzia Life is ideal for clinical practice or home use to treat pain and injuries. 7,83 Harmonics (Schumann Waves) (Frequencies include 7,83 Hz, 14,3 Hz, 20,8 Hz, 27,3 Hz, 33,8 Hz.) Each frequency runs for 7.5 seconds. 15 Hz – According to Sisken and Walker – 1995 – One of the frequencies that has demonstrated a decrease in skin necrosis, stimulation of capillary formation and fibroblast proliferation. 30 Hz – Stimulation of elastic tissue and insertion points. Elastic tissue refers to tendons and ligaments while insertion points are where the muscles and the elastic tissue meet. 77 Hz – Scar tissue acts as a barrier to inter-cellular communication and has often been shown to be a participating factor in persistent pain. This frequency has been shown by many micro current users to have its greatest effect on scar tissue.